This 500 Hour Yoga TTC consists of 200-hour & 300-hour Yoga trainings, and is a residential traditional Hatha & Vinyasa focused Yoga TTC, and registered with Yoga Alliance USA. This Yoga Course is intended for the beginners and intermediate students who wish to go through long term advance yogic training. After the successfully completion of this training they receive 500 RYS Certification, and can register with Yoga Alliance as RYT 500. Excursion to nearby ancient Buddhist temples and sightseeing on Thailand’s highest mountain range. 500 Hour Yoga Teacher Training Course at our yoga School Yoga Vidya Mandiram is offered from a worldwide known NGO organization Yoga Alliance, USA. After the successfully completing the program the students will receive a 500 RYS (registered yoga school). After which they can get registered at Yoga Alliance USA and become a 500 RYT (registered yoga tanner). What is meditation & what is not? Systems within the personality: A deeper understaning of human personality which contains physical and subtler bodies, such as; 10 senses, mind, intellect, and ego. Basic mantras: aum, gayatri, trayambakam, guru, shanti etc. As per the criteria and requirement set for the 500 Hour Yoga Teacher Training Course by Yoga Alliance USA, there will be a reasonably tight schedule. This 500 Hour Yoga Training will be schedule on 6 days for the intensive study and practices and on the 7th day there will be Shrine & Temples Visits and Explore time as the related aspects of yoga training. In spite of such intensive schedule you could find this training an enlightening and interesting process of transformation. During your training you will have an opportunity to live with nature. The Yoga Training schedule begins at 5:30am with a short morning prayer followed by a pranayama session. Then there comes the morning session for the traditional Yoga Postures (Hatha-Yoga) before the breakfast. Then we have two main sessions; one philosophy and the other yoga anatomy followed by lunch at noon. Then there will be some self-study and Self-practice time after before we begin the afternoon and evening sessions of Vinyasa-Yoga Asanas followed by Relaxation & Meditation. There will be some inspirational cultural activities, such as satsang (devotional songs), lectures on yoga related subjects, audios and video lectures. The weekly assignments will be a part of the training as that is conducive to gain in-depth knowledge of the subjects and experience through your yoga practices. During this yoga teacher training you will be provided with three yoga vegetarian meals including fruit refreshments and green tea. Note: Daily Schedule is subject to change. The venue for Chiangmai 200 HR TTC is MaeWin Guesthouse & Resort, located about 60km southwest of Chiangmai city. You could opt for a direct flight to Chiangmai International Airport (CNX). If there are no direct flights from your city, there are certainly connections you could make from your city to Chiangmai. If you are traveling from within Thailand, you could take the train from the city you are into Chiangmai province. From Bangkok, the journey takes about 12 hours but evening trains feature comfortable bunks with or without air-con. Train tickets from Bangkok are between 600-1,000 THB for a train ticket depending on the level of comfort you want. Buses run roughly every hour from Bangkok to Chiang Mai, departing from Bangkok’s Mo Chit Station and arriving at Chiang Mai’s Eastern (main) Bus Terminal. The first departure of the day is at 05:30 and the last is at 22:00. 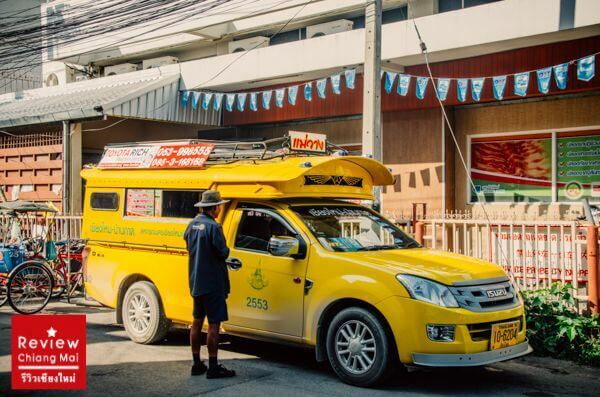 From Bangkok, the journey takes about 10 hours and there are a variety of busses available, with the VIP busses being the by far the most comfortable. Bus prices range from 12 USD to 25 USD per trip from Bangkok to Chiangmai. Yoga Vidya Mandiram is happy to assist you in arranging a taxi pick up once you arrive in Chiangmai. The taxi fee and travel time will depend on your pick up location and traffic. It is an average of 1.20 hours from Chiangmai International Airport (CNX) to the guesthouse by taxi and costing around 1,000 baht per trip.